Dominique Belluard, Dom to his friends, has worked his family’s domaine in Ayse since 1988. When Dom took over, the domaine was in polyculture, with dairy cows, apples, and other crops in addition to grapes. Dom is very much a farmer, but he wanted to focus his energies on being a vigneron, so he increased the vineyard plantings. He was particularly drawn to Gringet, a white variety found only in Ayse that was nearly extinct. A few local growers sold grapes to the co-op for sparkling wine, but there were no efforts to make fine wine or vins de garde from Gringet. Dom expanded his family’s plantings through selection massale and has spent the past couple decades becoming the master of Gringet and showing the world its potential in Ayze’s terroir. 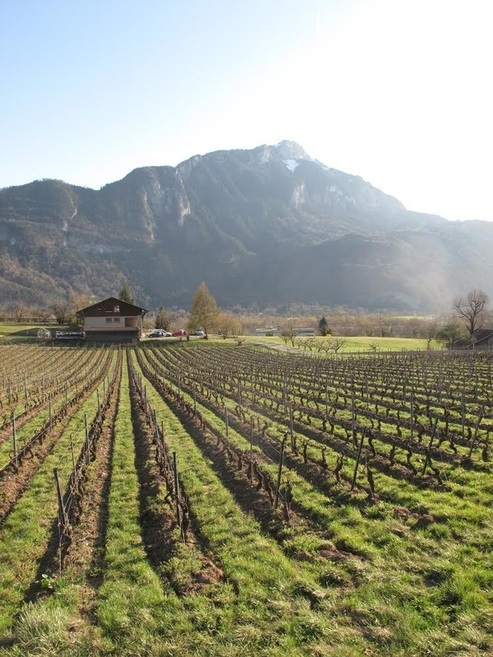 Ayze is only about 30 miles from Mont Blanc, but the Belluard vineyards are planted relatively lower to allow ripening. Dom has vineyards planted from 300 to 450 meters above sea level. Make no mistake, these are mountain wines. But they are not planted next to ski slopes. All are farmed biodynamically and were planted by selection massale. The vine ages vary from ten to sixty yearls old. Domaine Belluard has about half of the Gringet planted in the world. Prior to Dom rediscovering the variety, Gringet was used almost exclusively for sparkling wine intended for casual chugging. Dom honors that heritage and makes two beautiful sparkling Gringets. He also explores the grape’s potential for still wines and has found it to be expressive of Ayze’s terroir and delicious. In addition, Dom makes still wines with two other, more common Savoyard varieties – Altesse (also called Rousette) and Mondeuse. Dom’s cellar practices are as careful and thoughtful as his farming. All fermentations are native and elevage typically occurs in cement or stainless steel. Dom sees great potential in cement eggs for elevage and has invested greatly in them, as he thinks the movement on the lees suits Gringet particularly well. Les Perles du Montblanc is a non-vintage sparkling Gringet from limestone heavy clay at about 300 meters above sea level. Mont Blanc is a vintage méthode Champenoise that spends years on the lees, made from grapes grown at 450-meters in iron heavy soils. Les Alpes is Dom’s still Gringet bottling. Always fresh, aromatic in a very delicate way, and often a wine of texture. From grapes grown at 350 meters. Pur Jus is Dom’s no sulfur Gringet. He does not make this every year, and when he does, it's in very small quantities. Le Feu, is Dom’s single-vineyard Gringet. Dom named the vineyard Le Feu (the fire) because of its reddish soils, comprised of clay with a lot of iron. The vineyard sits at 450 meters. Le Feu shows the heights of Gringet and Dom’s work as a vigneron. Grande Jorasses is Dom's Altesse bottling. He sourced the original vines from Noel Dupasquier in Jongieux, another of our vignerons. The plantings are relatively new, dating to [insert], but the wines are exciting, showing a different side to Altesse as it reflects the Ayze terroir and Dom’s careful hand. Mondeuse en Amphore is a very rare bottling that sees no wood. Dom has only slightly less than an hectare acres of Mondeuse, which is known for low yields. This is a singular wine, showing a wonderful grape in a unique terroir raised by a skillful vigneron.